Creating truly outstanding small space landscapes is a specialty of certain well known designers. Their fame is based on a firm grasp of three valuable techniques that your designer can exploit just as easily. When you hire a company to help design your outdoor living spaces for the condo, the townhouse (see Townhouse Landscaping) or just a not-so-large yard, here are the basics for getting it right in cramped quarters. Concept #1 Plan for multiple focal points. Keep in mind that you need not have all these objects at the start of the project. Opportunities will arise both during and after the design process. Avoid mass produced items that may be seen elsewhere. Make your small space landscape uniquely yours by searching for one of a kind architectural salvage, antiques and original works of garden art. Don't make the mistake of putting all these focal points front and center. Certainly one or two may be outstanding in the garden as a basis for surrounding spatial or planting design. The others are best sequestered amidst the plants, looking as though they have always been there. Remember, it's about visual discovery, so when a guest suddenly spots one there in the green or amidst the blooms, it offers the joy of surprise. Imagine dining in a garden where these carefully composed surprises positioned for the guest to find throughout an evening compared to a space featuring just a single focal point. Concept #2 Design in inches rather than feet. Within a large landscape there are always parts overlooked by the designer, but this isn't a problem because they are rarely noticed. But in a small space landscape, every ill-conceived detail and each omission will be highly visible at close range. In some high end resort communities, property may sell for thousands of dollars per square foot, and here the emphasis is on obtaining the greatest benefit out of each inch of precious space. Thus, this most important concept illustrates how important it is that you and your designer consider every bit of ground and maximize its detailing and usability. Standard design utilizes square feet as its typical unit of measure. Small space gardens must think in square inches because fitting all the amenities you want in that limited area requires a very precise layout. The difference of six inches here or there can determine whether or not you can add a water feature (see Ponds and Fountains) or a fire pit. 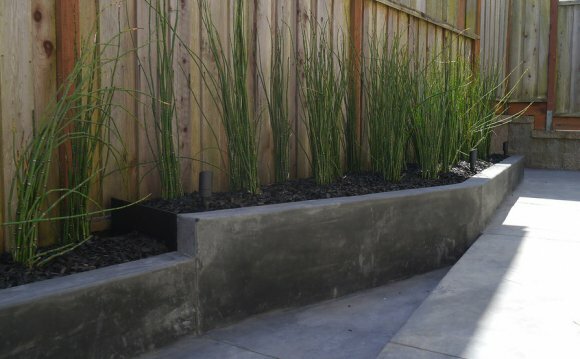 Two inches may be the deciding factor on whether you can expand your raised planter wall to seat wall width. Failing to work in such detail means you may miss out on valuable opportunities that make the spaces more useful, diverse or attractive. Pro Tip: Standard landscape plants are usually drawn at 1/8"=1'-0" scale, but for the designer to achieve the kind of detail necessary for a small space landscape plan, it must be drawn at 1/4"=1'-0". Concept #3 Indulge in high quality materials. Today's construction materials are more varied and luscious than ever before. The global economy allows import of exotic stone from far corners of the world or just across America. New manufacturing technology makes a much wider range of innovative ceramics readily available for residential landscapes and outdoor living spaces. In larger landscapes though, the expansive spaces drive cost of using such unique materials out of most budgets, even high end ones. The real beauty of small spaces is they allow you to afford the lavish materials you only dreamed of in the past, simply because you need only a small amount of it to get the job done. With the door open to such affordability, don't miss out on making truly exceptional choices for your masonry. Pro Tip: In the standard landscape you start with concrete and work your way up to more expensive options. With small spaces, start with super high end choices and work your way down as budget dictates. Always consider your paving materials relative to the interior floor materials to match them as cleanly as possible. If you are using travertine marble on the inside, use a porcelain tile that mimics its color and texture outside. Another technique for small spaces allows exciting accent materials too. When your designer has options for creating bi-colored effects just like accent tiles in kitchen and bath, the resulting design can make close range inspection a delight. If these accent bands or fields are made of the outstanding new colored glass tiles, for example, there are many opportunities for integrating them with an outdoor lighting system for creative illumination after dark. When it comes to design of small space, attend to the details, design every inch, integrate surprise and splurge on materials. Whether you decide to create a very powerful and exciting small space design or a Spartan modern minimalist one, remember always that less is more.